Avoiding a large fire can be accomplished by investing in commercial fire alarm systems! Whenever a commercial fire alarm system activates, the first reaction is to evacuate out the front door. While training for employees and fire drills can mimic what happens during a fire, they will never feel quite like the real thing. Evacuating the building as quickly as possible is important and easy to practice. Here’s what you need to know about what you should expect after your commercial fire alarm system goes off. Contrary to popular belief, the fire alarm and the fire sprinkler system are not directly tied together. The activation of a fire alarm system does not mean the sprinkler system will activate. Standard fire alarm systems are set off by one of two methods; smoke gets into a detector or someone pulls the manual pull station. The sprinkler will only activate if the heat of a fire sets off a sprinkler head. This takes considerable heat and should only occur well before Then the sprinkler in that specific area will release to extinguish the fire. If smoke sets off the fire alarm system it will be well before the fire gets to a level that initiates the sprinkler system. This allows people to get away safely. When the alarm sounds, everyone will need to evacuate the building. You should have a clearly posted evacuation plan already in place. Once the commercial fire alarm system starts to sound, everyone should start following the evacuation plan. Once everyone makes it to the designated meeting spot, confirm everyone is there. Many times, an employee might be in the restroom or even in a quiet area with noise canceling headphones, so everyone should ensure that every last person gets out of the building safely. If you are missing anyone, do not re-enter the building. Instead, wait until the first responders have arrived and notify them accordingly. If your commercial fire alarm system is incorporated in with a monitoring system, first responders will start arriving at the scene. As soon as you know that everyone is out of danger, call 911 again to ensure that they are on the way and offer any additional pertinent information. After the fire has been extinguished and your building has been deemed safe to re-enter by the fire department, have everyone enter and remove any valuables. Unfortunately, many commercial fires leave buildings more susceptible to break-ins, so it’s critical to get all valuable items out before leaving. Next, take the time to contact your insurance company as soon as possible. The recovery and rebuilding process is dependent on your insurance policy and the results of the fire investigation (if there is one). An insurance adjuster will travel to your commercial property, survey the damage, and offer their recommendations to the insurance company. 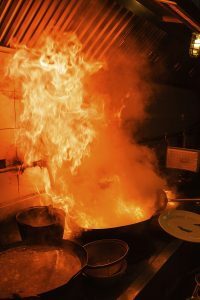 Commercial fires can be very frightening for everyone involved, but preparing for a fire can mean the difference between a smooth recovery and a scary and damaging event. Last, but not least, remember to have your fire alarm system repaired and re-inspected to ensure that it will work properly in the event of another fire. Nobody wants to imagine another fire striking their property, but it’s critical that your alarm system continues to function properly. If anything didn’t activate properly, Fireline will also be able to take care of any repairs or additions to your fire alarm system that you would like to add. This entry was posted on Thursday, June 29th, 2017 at 9:32 am. Both comments and pings are currently closed.